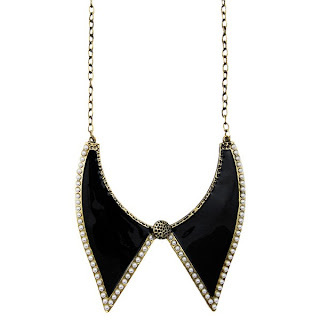 Collars are HAWT this season and, oh so, easy to wear! We love how throwing a collar necklace over the most basic of tops/dresses brings them bang up to date and, well basically, anything that works best with a plain tee gets the thumbs up from us. So, naturally, we bring you Collared, our latest A/W collection. (All this collar talk is making us more than a little obsessed with the androgynous look!). We heart this Dixi Black Collar Necklace, £12, mainly because of its shiny black enamel which literally goes with anything but also because the bead detailing around the edge of the collar is super gorgeous. 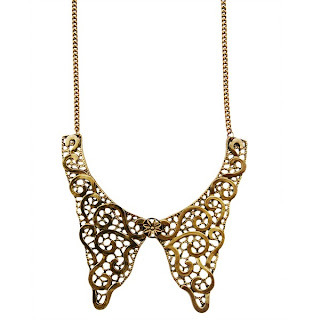 Oh my, this Baroque Collar Necklace, £12, is simply to die for. Such an opulent piece and an absolute must for party season. A derivative of the amazing collar trend is the collar chain, which pins straight onto a shirt collar. 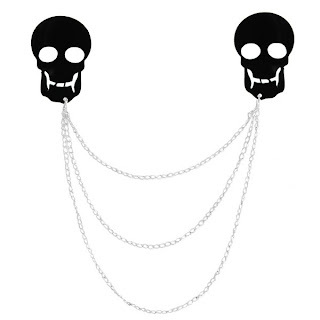 These Skull Collar Chain Pins, £9, are sufficiently MEAN! Halloween accessory, anyone? Who doesn't love a splash of leopard print?! 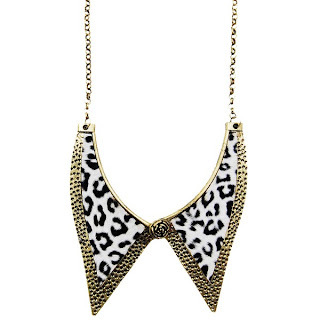 This Lucifer Snow Leopard Print Collar Necklace, £13, is an absolute babe! These collars look great! I am loving the trend of beaded collars on blouses, so this is a really cool alternative! I am soooo obsessed with collars at the moment, i need all four.